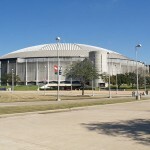 Dubbed the “Eight Wonder of the World”, the Astrodome was home to the Houston Astros for over three decades and was the first dome stadium constructed. 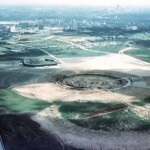 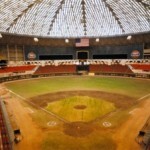 Prior to Major League Baseball awarding Houston an expansion franchise a dome stadium was already being planned by Judge Roy Hofheinz. 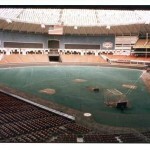 He constructed a model of the dome stadium and presented it to National League owners in 1960 in an effort to lure a MLB team to Houston. 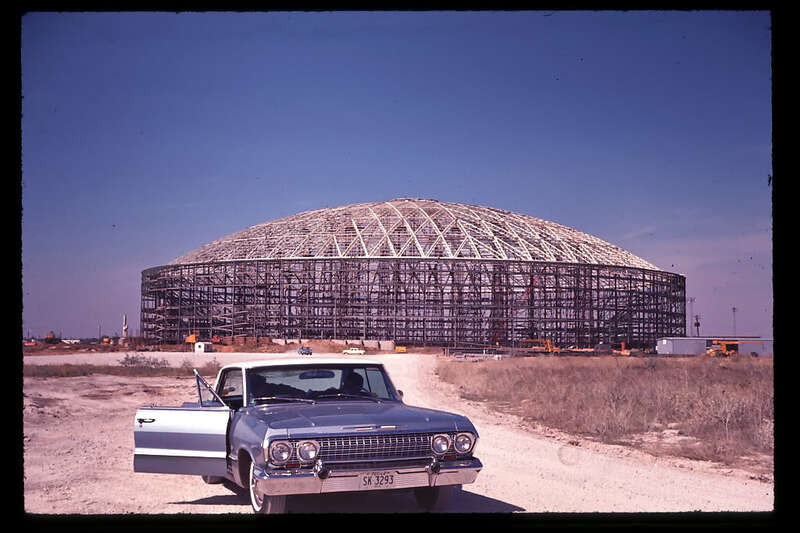 On October 17, 1960 Houston was awarded a franchise and voters approved an $18 million bond for construction. 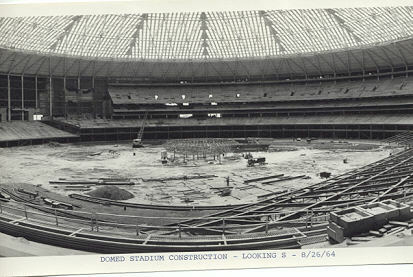 Construction began on January 3, 1962 and the baseball franchise, the Houston Colts .45s began playing in April 1962 at Colt Stadium, adjacent to the new dome stadium that was under construction. 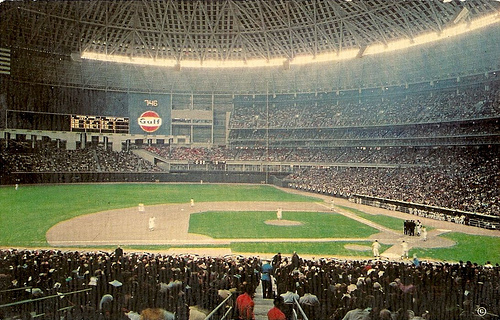 The Colt .45s played three seasons at Colt Stadium before moving into their new home. 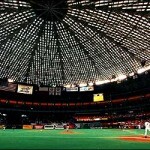 Originally known as the Harris County Dome Stadium, it was renamed the Astrodome as the Colt .45s were renamed the Astros. 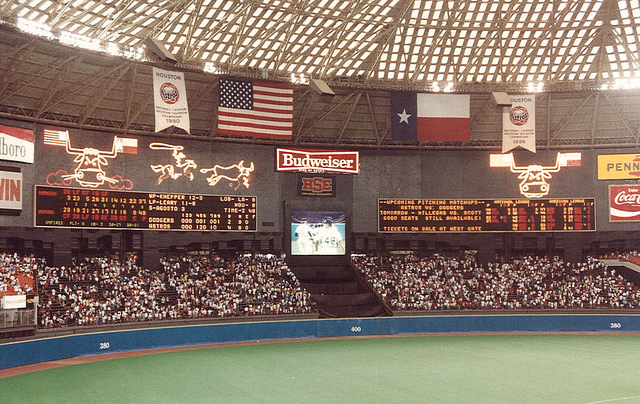 Fifth no hitter by Nolan Ryan on September 26, 1981. 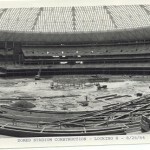 Game postponed because of flooding in Houston on June 15, 1976.
from gondola, 208 ft. above second base on April 28, 1965. 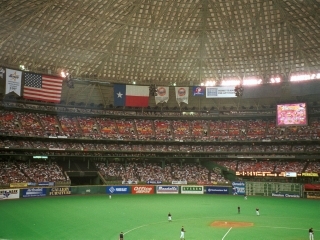 Bagwell and Craig Biggio in the 1990s. 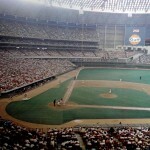 The first baseball game played at the Astrodome occurred on April 9, 1965, an exhibition game against the New York Yankees. 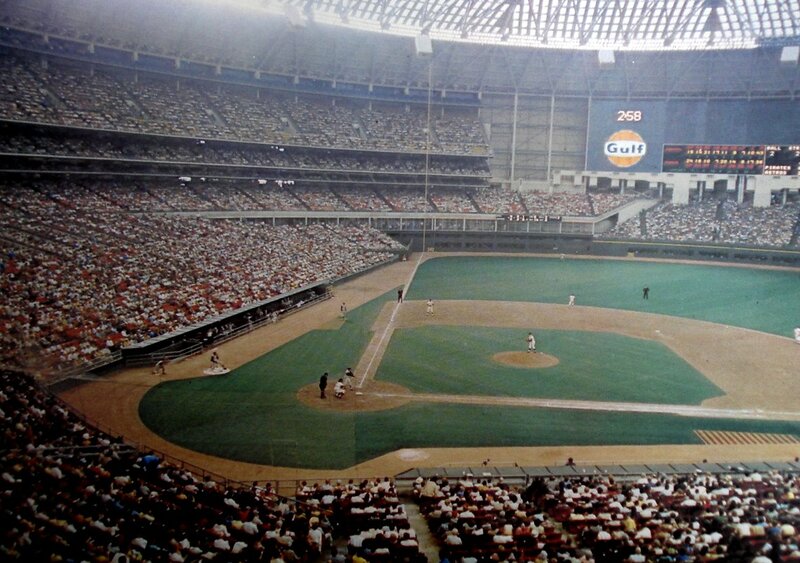 Three days later on April 12, 1965 the Astros played their official first game at the Astrodome against the Philadelphia Phillies. 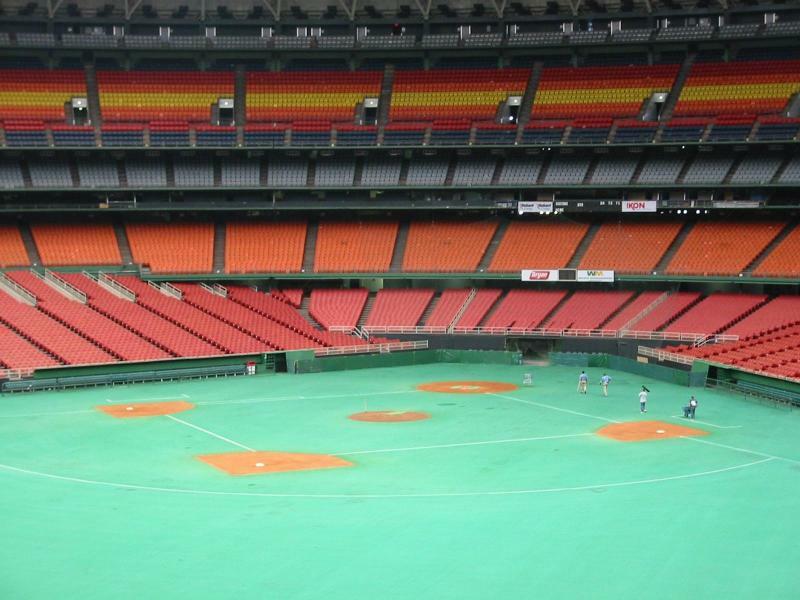 The stadium featured six levels of multi-colored seats that circled from the left field foul pole to homeplate and around to the right field foul pole. 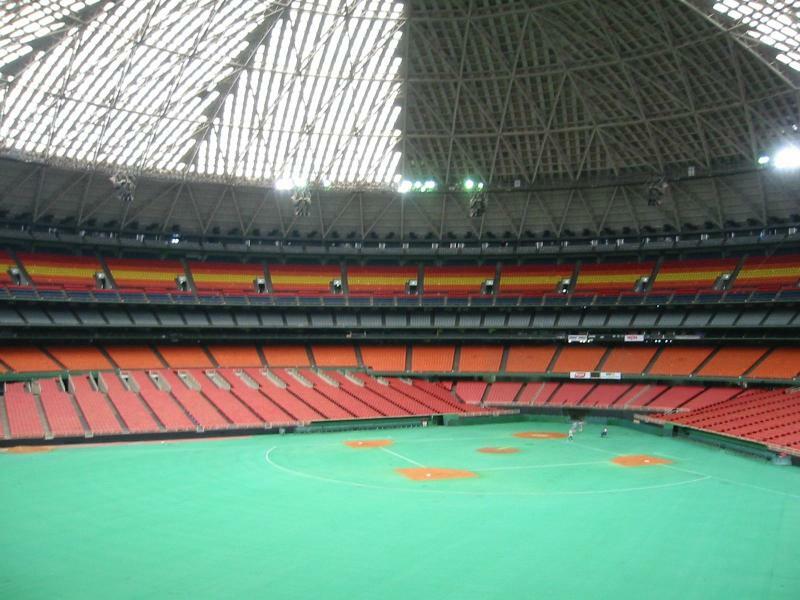 The Astrodome was one of the first stadiums to have luxury suites with 53 and each of the 42,217 seats in the Astrodome were cushioned. 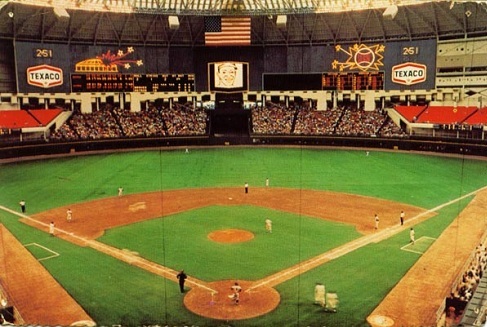 Behind the pavilion seats in centerfield was a $2 million, 474 foot long scoreboard, homerun spectacular and display picture board. 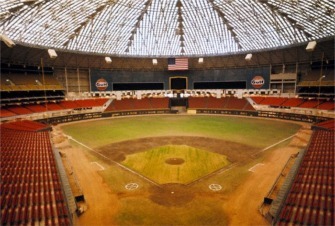 The Astrodome also had five different restaurants located throughout the stadium. 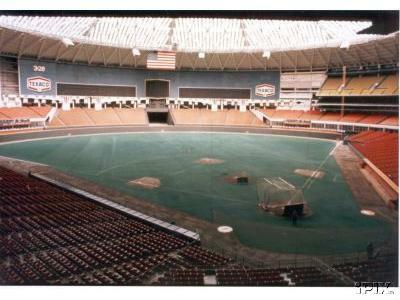 Original dimensions at the Astrodome were 340 ft. (left and right), and 400 ft. (center). 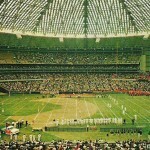 Not only was the Astrodome home to the Houston Astros, but to two football teams: the Houston Oilers (NFL) and the University of Houston. 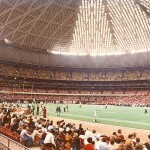 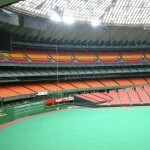 In order for football to be played at the Astrodome, two sets of 5,010 seats could be moved to form a football gridiron. 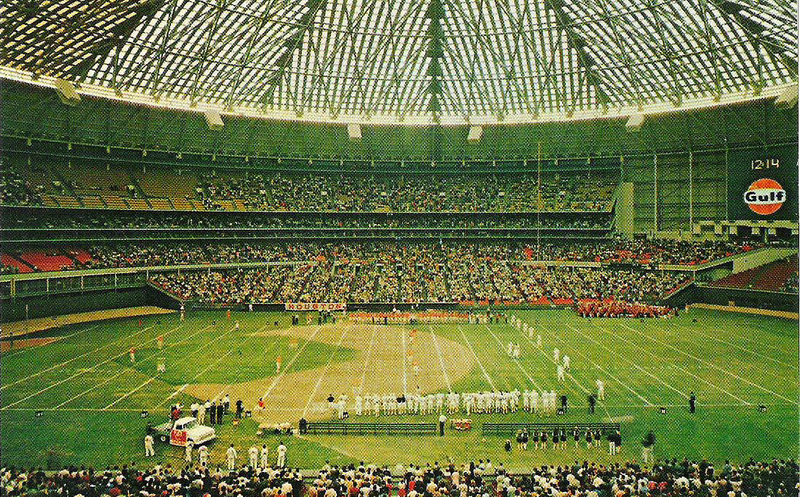 The actual dome was 18 stories above the playing field and consisted of “Lucite” skylights that were planned to allow the natural grass playing field to stay alive. 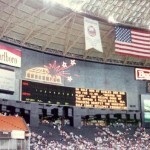 However, these translucent panels presented a problem. 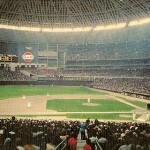 During afternoon games outfielders were blinded by the sunlight. 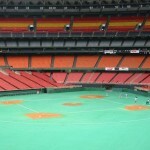 Thirty percent of the panels were coated with paint to reduce the problem but that caused another problem. 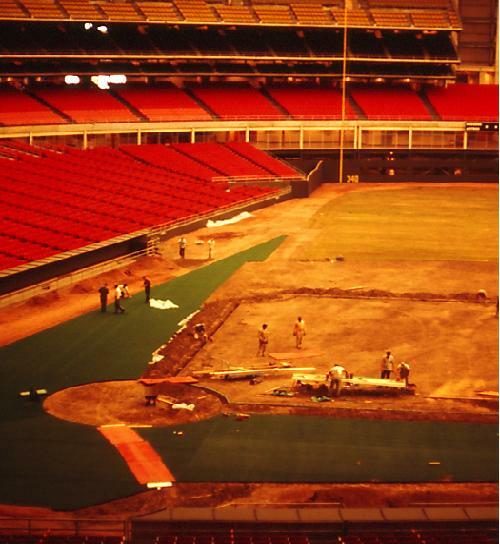 The natural grass playing field died due to the lack of sunlight A new type of turf that became famous at stadiums throughout the country during the 1970s was developed. 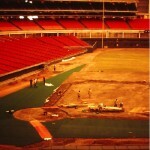 Named after the team, Astroturf was a green surface of nylon grass. 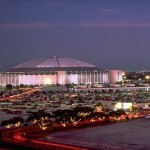 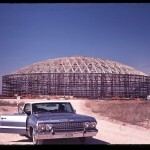 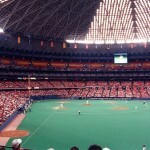 Over the next two decades the Astrodome changed little. 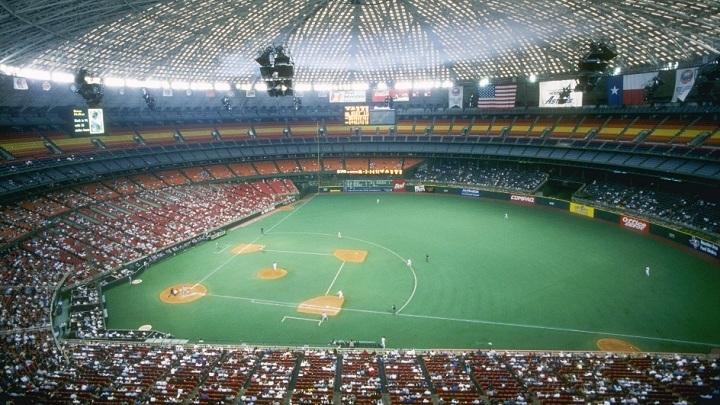 In Fall 1989, due to demands from the Houston Oilers the capacity of the stadium increased to 54,816 as the grandstands were extended into the outfield, now circling the playing field. 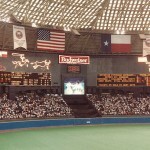 The original scoreboard was replaced by new video boards in the upper deck. 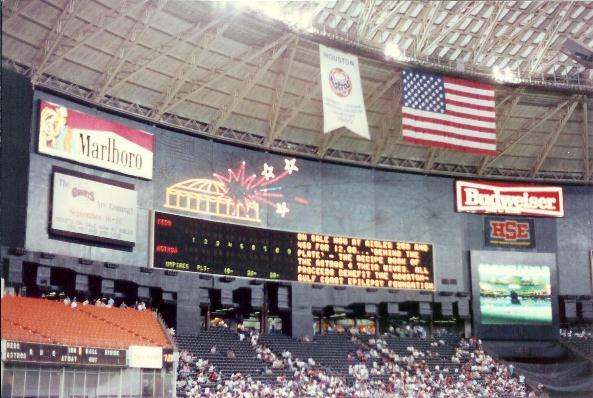 Two manual scoreboards were added as part of the outfield walls in both left and right fields. 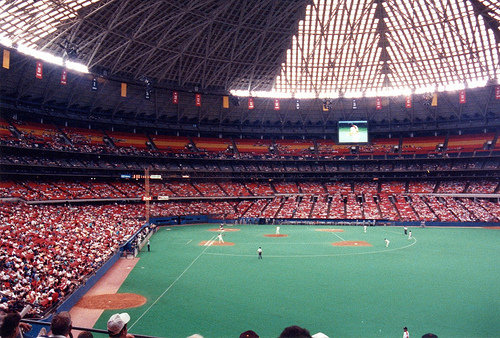 By the mid 1990s, both the Astros and Oilers began to want new stadiums built. 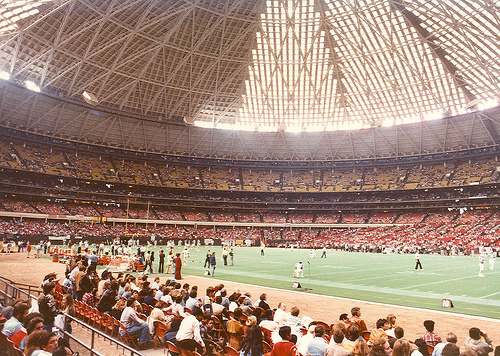 After failing to receive funding for a new stadium, the Oilers moved to Tennessee after the 1996 NFL season. 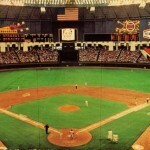 However, funding was approved for a new Astros ballpark in downtown Houston. 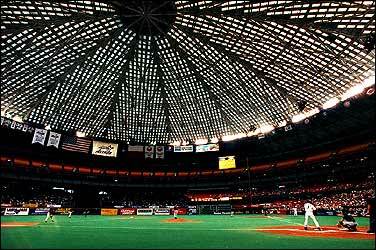 The Astros played three more season at the Astrodome, playing their final game on October 9, 1999. 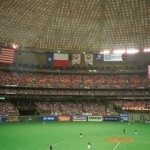 In 2000 they moved into Minute Maid Park. 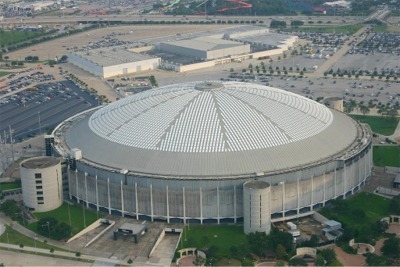 Today, the Astrodome remains virtually idle as it sits in the shadow of the Houston Texans (NFL) home, NRG Stadium. 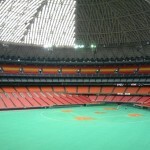 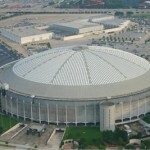 Since its closing after the 1999 season, the Astrodome has sat empty. 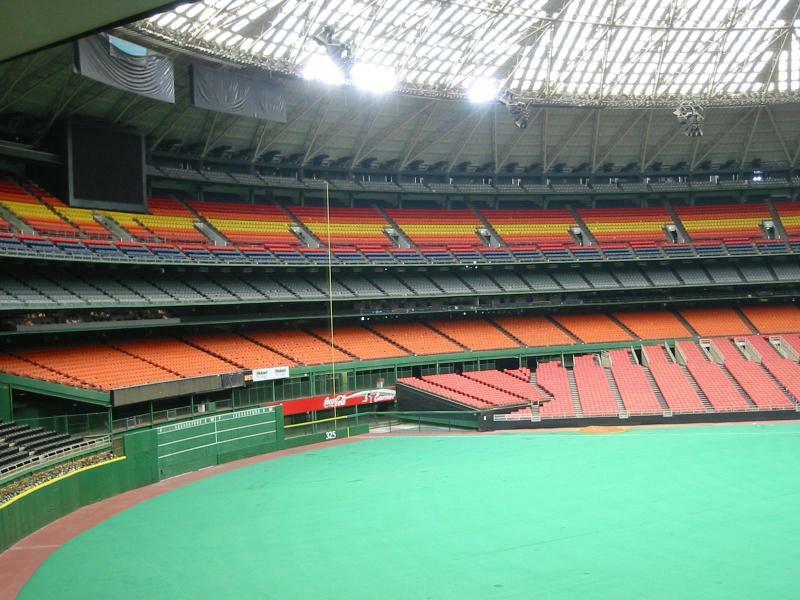 In 2016 nearly all of the interior fixtures including the seats were stripped from the stadium. 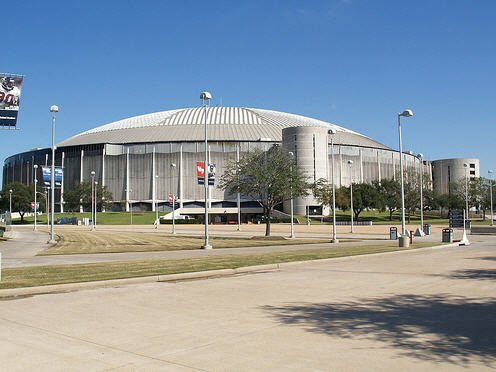 In February 2018 Harris County commissioners approved a $105 million redevelopment of the Astrodome. 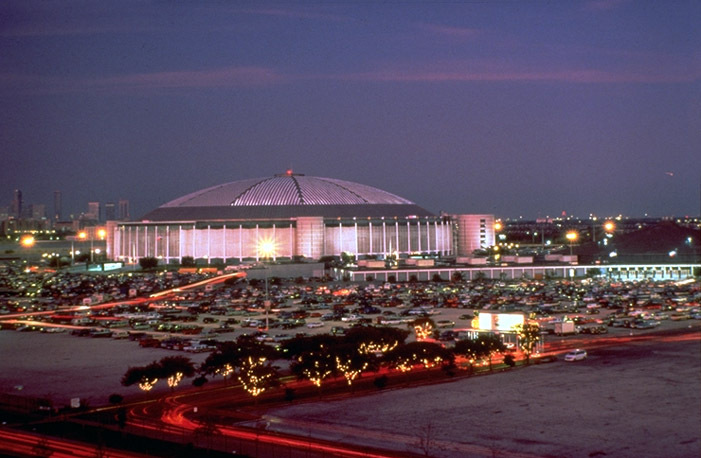 This plan includes raising the ground level two floors to create nearly 1,400 parking spaces that can also be used for festivals, conferences and commercial uses. 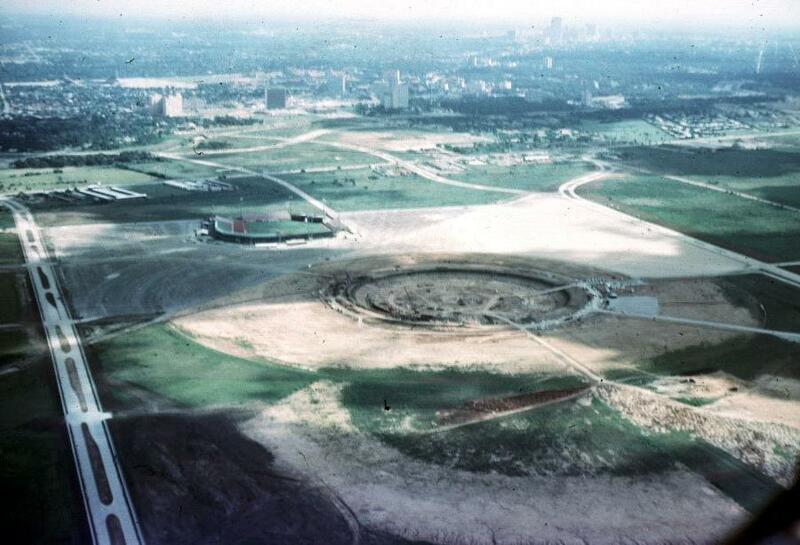 Construction is expected to begin in October 2018 and be complete by February 2020.